GYSTC has developed sessions over the years to address the needs of schools in our region that include the following topics: Vocabulary, formative Assessment, Writing in Science, Literacy, Inquire-Based Instruction, Project Based Learning, or STEM. These sessions can be delivered in a format that best meets the needs of your school such as planning periods, after school, or on professional learning days. With few exceptions, all of the materials, resources, and services listed are available at no cost to schools and teachers from membership systems. For additional information, please contact West GYSTC at wgystc@gmail.com or (678) 839-6147. Is there a piece of equipment you really want to use in your classroom, but not sure how to use it? Do you wonder what all you can check out and use in your classroom from West GYSTC? Join us at one of our Kit and Equipment Training's we hold quarterly at West GYSTC. Classes are free; books are $26 for each class. Complete the registration and payment information below. Do you have limited time to teach science content? Would you like to deepen your knowledge of science concepts? Join us as we incorporate science and literacy standards in amazing STEM activities that you can use in your classroom. Leave with a plethora of ideas to use in your classroom covering the physical, life and earth science standards. FREE for members! 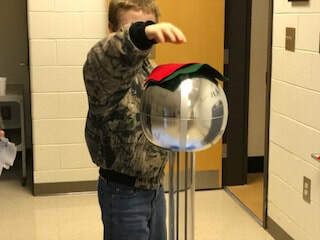 February 28, 2019: Physical Science and Literacy in a K-3 Classroom: Sound, light & color, electricity & magnetism, force & motion and more. March 14, 2019: Earth Science & Literacy in a K-3 Classroom: Astronomy, fossils & rocks, Earth & moon, and more. March 28, 2019: Life Science & Literacy in a K-3 Classroom: Classification, life cycles, habitats, microorganisms, germs, health, and more. Still a little nervous about crossing over and incorporating STEM into your classroom? Join us for a fun time of STEM basics and participate in STEM activities related to GSE (Georgia Standards of Excellence). Distinguish between a "project" and "project-based learning" while developing a framework for how to implement PBL into your classroom. Leave with some PBL ideas to try in your classroom. If you are interested in checking out this equipment, you must attend a training session. Learn tips on set up and care for the Star Lab. Leave with links of lesson ideas from teaching topics from the solar system, plant cell, Greek Mythology to Earth's Geography. Also, learn how to use the hover craft and Van de Graaff Generator. Using a framework, teachers will develop lessons and engineering challenges based on texts they're already reading with their students. This is curriculum integration at its best.